What’s the single most recognizable bridal accessory? It’s not the shoes, it’s not the jewelry, it’s not even the dress…it’s the veil. The veil first made its appearance in ancient times when brides would wear it to ward off evil spirits. Since then, it has been used to symbolize purity and innocence, to mask the identity of the bride to her future husband and more recently, it’s taken its place in the bridal world as a fashion accessory. · Blusher Veil – This is a short veil (24 to 26 inches from the top of the headpiece to the hem) that falls just below the collarbone but sits above the bust. Since the blusher veil was originally created to show the bride’s modesty and innocence, it is very popular with first time brides. Because it covers the entire face, the blusher veil adds an extra dimension of drama to the ceremony. As such, it is gaining popularity with second and third time brides as well. 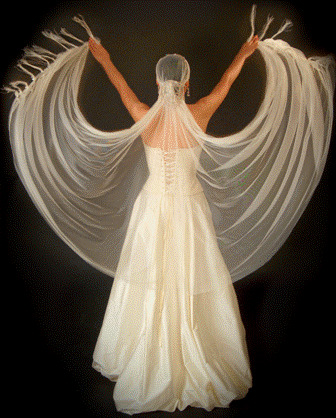 · Fly-away Veil – This is a multi-layered veil that just brushes the shoulders. It is a considered less formal and should be paired with a less formal gown; however, gowns with extensive detailing along the back work very well with this style. · Birdcage Veil – Traditionally more common for older brides, this veil extends to just over the chin. It is made of a wide open weave of netting called Russian veiling. It works great with cocktail dresses or fitted dinner suits and is most commonly seen at civil ceremonies. 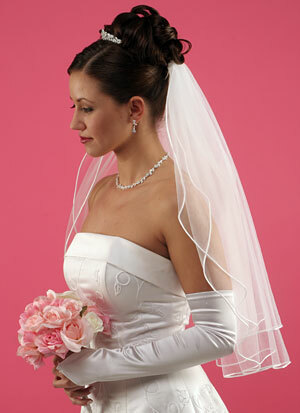 · Elbow Length Veil – Just like the name suggests, this veil extends to the elbow. It can be multi or single layered. The multi-layered option can have 2-3 layers cut to the same length or cut 1-2 inches apart for a fuller look. · Fingertip Veil – One of the most popular veils, it extends to the bride’s fingertips. This veil is the most flattering style for any bride and works with any style gown. Its length is comfortable enough that it can be worn throughout the ceremony and reception. · Ballet Length Veil – This veil extends to the ankles but does not touch the ground. This is an excellent choice for a sheath gown or a gown with no train. · Chapel Length Veil – Worn with gowns that have a chapel length train, this veil extends 6-12 inches beyond the length of the train. Since it’s harder to move around with this length, the bride usually removes it for the reception. · Semi-Cathedral Veil/Cathedral Veil – Both these veils are worn best with the train that shares their respective names. They both extend 6-12 inches beyond the length of the train and are difficult to move around in. Neither is recommended for wear during the reception. Veils add drama, mystery, and romance to any ceremony. They create an aura around the bride that makes her walk down the aisle all the more magical.